Hi there and thank you for visiting our site. Here we are to help you to sort out right from wrong. Today the area of crypto-currency trading schemes is extremely popular. This is where people make real fortunes in a “quick and easy” way. And this is where a lot of swindlers come to take their extraction out of investor’s pocket. Scam project is a trading tool initially designed to deceive people. Usually they allow you to earn some small money within a certain period. It’s exactly how all gambling schemes act. When you play cards with rascals, they do the same. But when the stake is high they take all the money and leave you deeply disappointed. The most widely spread method is when a company announces that the accounts have been hacked and a bigger part of money was stolen from the payment system. This is what happened, for example, with Kloss Pamm project. Sometimes the scammers tell a story on a certain trader or an employee who are responsible for the money loss. So all the guilt is on them. Yet their names are not published. Or you’re informed that the company experiences problems with banks, partners, software etc. Excellent explanation why they stop payments and block clients’ e-wallets, isn’t it? So beware using CarbonFX as many signs indicate this system is a scam. Now we’ll try to investigate all its features to prove the statement. 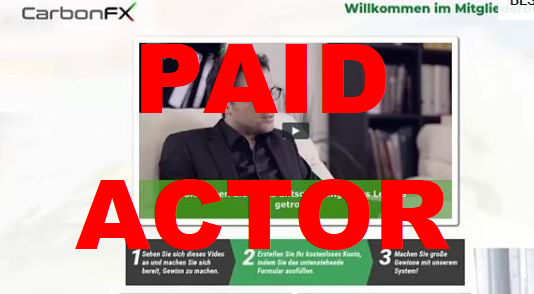 CarbonFX software is a trading application for Forex that presented by self-proclaimed German-native Michael Klein. This scam service has been available for quite a long time now. The site specifically is targeting German-speaking users, but there is also English version in the Internet. Mr. Klein tells the story on himself as an experienced crypto-currency trader and software developer. He admits he was cheated a number of times while using different trading systems and that made him to create the software of his own. This one supposed to be working very well. All tests showed only good results. Should we trust it? Let us first examine what the CarbonFX offers and see what its promises based on. At the first glance, it seems the system is trustworthy. All features needed to make money online are present. Like many others, the site holds bright slogans calling you to join. One of them placed right on the first page and read as “Don’t miss out your chance to use the only trading system that gives you $1000 profit per day!”. Later the video presentation speaks on great opportunity to make tons of money with this system. All the way it keeps persuading you the product generates a decent income. It’s worth to say Michael Klein’s speech leaves a very pleasant impression. He speaks as a man who knows well what he does. No doubt, it produces a considerable psychological effect on viewers. But don’t hurry up to create an account, better go on looking and considering. Soon you will find out the CarbonFX has no license and gets registered nowhere. Such an organization officially doesn’t even exist. The video doesn’t tell us how the software works, how it operates, who is actually behind it. The only one we see on the video is a sole actor Michael Klein himself. Three photos below do not belong to a real people who use the software, these are just stock images. So their testimonials are nothing else but false. Take the first one, Siegfrid Schuchmann, 42. When we run the image search service, we can see a multiple match. This man’s picture appears on many websites linked with different countries. So, the CarbonFX attaches those images in order to look legitimate. The second so-called witness under name Ashley Donovan, 39, you see with English flag beside. She is allegedly from city of Cork. But that city is actually situated in the South of Ireland. It’s highly likely that the system staff is using an ID widget to confuse the traces so that no one can guess what country they are from. Since all those hidden facts get uncovered, it becomes clear that the CarbonFX is a scam. The experts in digital trading sphere say that the ordinary system has about 50 percent of success. The CarbonFX looks suspicious because of fantastic income growth the system robot can generate, as they insist. And this result is available even for newcomers. Unbelievable! Obvious contradictions in Michael Klein story. He tells about himself as an ordinary guy, with average or low income. So how can he hire high-tech programmers to help him realize such an expensive trading platform project. Mr. Klein tells the software is homemade, supposedly in the quietness of his bedroom. Then why he invited a bunch of world-level specialists with all the equipment needed to get the software ready? The personality of Mr. Klein doesn’t exist at all. According to the research we made, the guy who leads the video presentation is just a paid actor who was hired to read the text. If you listen carefully what he says you clearly understand that he has no idea of what he is talking about. This scam system uses classic pressure tactics that scam services often use in the marketing area. Michael Klein or someone who carries this very common name in Germany has never been associated with the CarbonFX software. He was chosen by the criminals in crypto trading area to be a scapegoat. Therefore, the real thievery organizers hide their identity and stay in shadow. We strongly recommend using another digital trading platform, which is tested well and showed to be a good one. It is “Tool Trades” system. The software has a lot of revolutionary characteristics that make it outstanding among many other on the market today. It is very easy to use, that makes it especially valuable for beginners. You have to do several simple steps to get started. According to the research data we got, “Tool Trades” is beyond competition and has a leading position in the area of crypto-currency trading. Previous PostStockbit Review – who are they and what do they do?